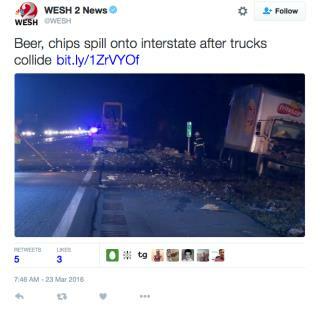 (Newser) – It wasn't a happy hour for some central Florida drivers when trucks carrying Busch beer and Frito-Lay chips collided, spilling them both along Interstate 95 early Wednesday morning near Melbourne in what KUSA is calling a "couch potato's dream." Per the AP, Florida Highway Patrol spokeswoman Kim Montes said in a statement that Zachary Basinger of Melbourne had stopped his Frito-Lay box truck on the right shoulder of the highway. Roberto Ferrer Rodriguez of Miami, meanwhile, told troopers he was trying to move his beer truck into the center lane but saw another vehicle and swerved back into the right lane. His truck then struck the chips truck, the Frito-Lay truck overturned, and beer and chips spilled onto the highway. Next on Newser: What's Behind the Phenomenon of Brother Terrorists? 2017 Super Bowl ad in the making? Party time on I 95.